STOCKHOLM (JP) - Farmers in northern Sweden are milking moose, hoping that cheese-lovers with deep pockets will develop a taste for moose cheese. It's healthy and tasty - and very expensive (nearly $500 per pound) because moose milk is hard to obtain. Christer & Ulla Johansson started the 59-acre “Moose House” - the only moose dairy farm in Europe - seven years ago in Bjursholm (400 miles north of Stockholm). 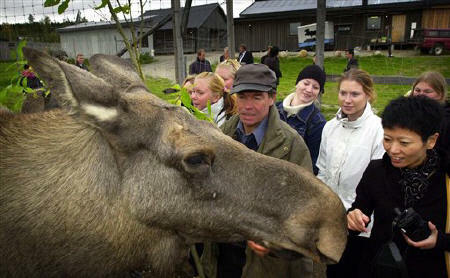 Moose House has 14 moose in the fields, but only three cows (Gullan, Haelga & Juna) can be milked. The cows were found as abandoned calves in the woods around Bjursholm, and were taken in by the Johansson family. The domesticated moose stay outdoors all year, and weigh about 500 kilograms (1,100 pounds). Why so expensive? Moose only produce milk between May and September, and it takes up to two hours to milk a moose, with each producing up to a gallon of milk per day. Moose milk contains 12% fat and 12% protein, is kept refrigerated and curdling is done three times per year – yielding 660 pounds of cheese per year. Made in three varieties, the moose cheese can be sampled at the farm’s restaurant. Sales are mainly to upscale Swedish hotels and restaurants, and they have plans to export more cheese - especially their sour feta-type, which is laid down in oil and is easy to transport. Moose House attracts 25,000 visitors per year, and is the main attraction in an activity center that also offers fishing, golf, canoe tours, and riding.